I’m taking the week off paranoid dystopias, period thrillers, true crime conspiracies, and grisly police procedurals – the cheery usual favourites in my streaming range – to take in this Canadian comedy, which has been knocking out seasons annually since 2015. Schitt’s Creek slipped by me at first glance, in part because the title suggested a show worthy of a 1am slot on 7Mate, but the longer it has run the more advocates it has gained. The flipside to that is patience – even watching the first season you can see the writing getting past the droll initial concept and discovering what the characters have to offer. Apparently that only accelerates with each subsequent season. 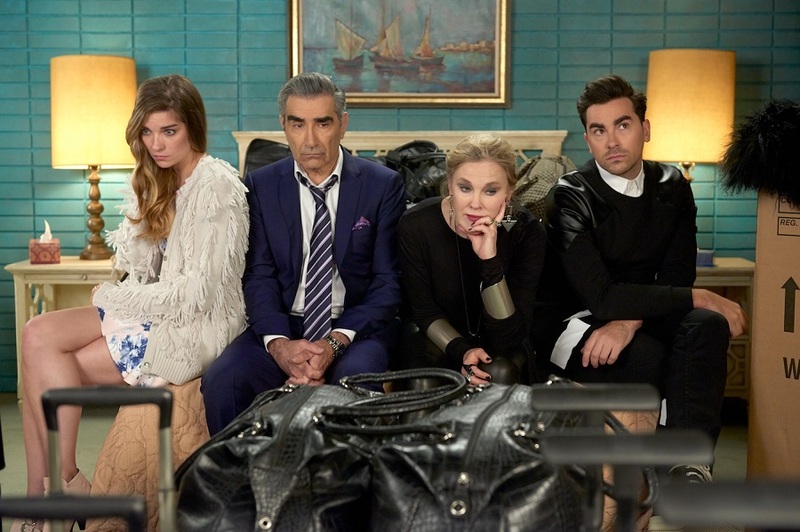 It begins with the repossession of everything – including the privileged unity – belonging to the wealthy Rose family: patriarch Johnny (Eugene Levy), his wife, former soap star Moira (Catherine O’Hara), conceited son David (Daniel Levy), and socialite daughter Alexis (Annie Murphy). Cleaned out by a duplicitous business manager, they’re left with a value-free asset, the small town of Schitt’s Creek, which they bought as a joke for David’s birthday years prior. Relocated to the town and suffering from luxury-deprivation shock, they’re tossed into a working class community where they are fish out of the coconut water. There are echoes of Arrested Development’s set-up here, but the model that begins to take hold is Parks and Recreation – irascible warmth, confounding humanism, and eccentric insight. It helps that the townsfolk are politely bemused by the Rose clan and their demands. “Due to a lack of everything we don’t do room service,” explains Stevie (Emily Hampshire), the sardonic motel clerk who is their first port of call. The show – created by the father and son Levy team of Eugene and Daniel respectively – rarely punches down on the locals’ failings, although the mayor, Roland Schitt (Chris Elliott), is a flagrantly grotesque character. What will occupy you as the first season finds some depth? Catherine O’Hara. The comic great, like Eugene Levy a mainstay of Christopher Guest’s mockumentaries, is magnificent as Moira. For all her grand dame excess, there’s a current of fizzled humanity to her pill-popping excess and hysterical meltdowns that slowly comes to life; a sequence early on where Moira invades a high school grade prepping a drug awareness play is basically a masterclass for O’Hara’s comedic gifts. So hang in with the initial snippiness and self-deprecation, because there’s more to come, including a gay romance that leaps off the sitcom rails. This could just be your go to comedy. Extinction (Netflix, 2018, 95 minutes): Extinction is the kind of film that hangs everything on the revelatory value of a big twist. From the opening scenes, set in a gleaming futuristic society, the nightmares of a destructive entity taking his family that afflict everyman Peter (Michael Pena) point to a momentous explanation. The problem is that the derivative science-fiction mystery glides towards that moment with servile expediency – not even Peter and his wife, Alice (Lizzy Caplan), trying to protect their children from the arrival of his fears can fracture the waiting game. You may get a kick out of the eventual explanation, but Australian director Ben Young, in his follow-up to the shattering 2016 suburban horror tale Hounds of Love, struggles to impose a visual signature on the material, which manages to mostly strip the immensely likeable Pena of his playful relatability. The flawed Annihilation, the woeful The Cloverfield Paradox, and now Extinction – Hollywood studio science-fiction films belatedly sold to Netflix for worldwide streaming now constitute a suspect sub-genre. Also New on Netflix: Derided on release for being too slight, Focus (2015, 104 minutes) is actually a glossy, enjoyable take on con artists, driven by delicious scams, misdirection, and the genuine chemistry between Margot Robbie and Will Smith; The Departed (2006, 151 minutes) is Martin Scorsese’s most reductive gangster film, but it surrounds Leonardo DiCaprio and Matt Damon, as adversarial undercover agents, with a gamut of gaudy and garrulous Boston hardheads. New on SBS on Demand: A French romantic-comedy that gradually takes on real life weight, A Happy Event (2011, 105 minutes) tracks a young Parisian couple whose meet cute romance comes up against the demands of pregnancy and income; Pawn Sacrifice (2014, 115 minutes) is a determined biographical drama about American chess prodigy Bobby Fisher (Tobey Maguire) taking on the Soviet establishment at the 1972 world championship amidst deteriorating mental health. New on Stan: Lena Dunham set the scene for Girls with Tiny Furniture (2010, 98 minutes), a thorny comic tasting on life after university, artistic heritage and the harsh reality of familial love; an early feature from the director of A Separation and The Past, the masterful Iranian filmmaker Asghar Farhadi, Fireworks Wednesday (2006, 102 minutes) is a terrific invocation of the doubt and deceit lodged amidst middle-class life in Tehran.